Aircraft environmental systems often require flexible joints between pipe ducts or even complex rigid joints which prevent component removal after curing. Often this requires complex collapsible tooling which allows quick removal and re-assembly. (weight due to the manual nature of the lay-up process is a large consideration). Collapsible Al. 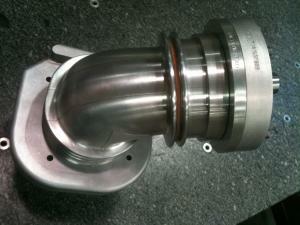 Alloy Tooling - For the lay-up of Carbon Fibre Pre-Preg. Rally Car Intake Manifolds.